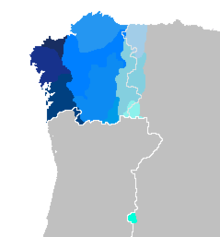 Galicia ( Spain) Official regional language. Decades of development as language of literature, including poetry and essays for all levels of education. Growing sense of ethnic identity. Distribution of the various dialects of Galician in Spain. Castro, Olga (ফেব্রুয়ারি ২০১৩)। "Talking at cross-purposes? The missing link between feminist linguistics and translation studies"। Gender and Language। Equinox। 7 (1): 35–58। doi:10.1558/genl.v7i1.35. LOIA: Open guide to Galician Language . Arquivo do Galego Oral – An archive of records of Galician speakers. A Nosa Fala – Sound recordings of the different dialects of the Galician language. Corpus Xelmirez – A corpus on medieval Galician documentation, in Galician, Latin, and Spanish.